I can’t put my finger on it, but it somehow seems like ‘Lost Trail’ offers, how poetic, a new musical path to the label [walnut + locust], a label that keeps on delivering fantastic music. 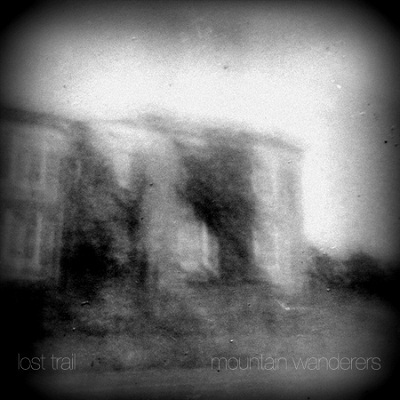 At first listen I find “Mountain Wanderers” to have some surprising dirty parts in it, where the sound of agony distorts itself into a black cloud of disturbing invocations, but then, on further exploration, I can finally understand how painful and intimate these distortions are. Together with ghosts of voices in the machine, and surreal, darkened tones, ‘Lost Trail’ spirals into vaguer and vaguer realms of sonic reality, realizing into sound the combination of pagan festivals and urban labyrinths, until the point where with the ears alone you can visualize pyres and lines of ritual energy through the dark city night. So far, I can name dozens of albums who do (or try doing) the same, but “Lost Trail” has an intimate virtue to it, and the music on these seven tracks makes stories for the brave listeners who go through the entire ritual. A noble experience, “Mountain Wanderers” is a mesmerizing trip. Take it.